Purchasing a vehicle is expensive but like many things the real expenses comes with the ongoing costs for insurance to keep your investment protected. GPS car trackers can help reduce your insurance rates and the overall expenses of owning a car with their anti-theft and asset recovery features. Insurance companies offer a variety of discounts but the most valuable discounts come from active anti-theft devices. GPS car trackers have three features that protect your vehicle from being stolen that insurance companies like to see on all the vehicles that they insure. First, GPS trackers can be wired to monitor your car alarm system and notify you (via SMS text) in the event someone breaks into your vehicle allowing you to call for help and get to your vehicle thus reducing the time thieves have to ransack and steal your personal property. Second, GPS car trackers can be set for movement from a particular parking area. For example, your home garage, your work carpark, your depot, or even the side of the road. The technical term for this set location is called a geofence. If the vehicle is moved from this location, the tracking device will sense that the car has moved outside the geofence area and it will send you a SMS text alert (and email). Finally, car trackers can work with the existing alarm system via two-way SMS communication and if your car leaves a specified area you can remotely disable the vehicle and sound the alarm to prevent the thief from continuing to drive the car. The fleetminder mobile phone app can be used to disable the starter motor preventing the thief from restarting the car. For example, the car won’t restart if the thief stopped for a robbery or went to pick up their “mate” for a joyride. If all of the theft deterrent systems are unsuccessful in preventing your vehicle from being stolen then there is one last benefit to having a GPS car tracker on your vehicle. GPS car trackers will automatically report the location of your vehicle to a cloud based server accessed 24/7 anywhere (with secure access) so you can recover you vehicle and reduce the amount of damage that is done. In the example map above, each location “log” sent by the tracking device forms a route helping you to pinpoint the final location of your car. Even if the thief tries to remove the tracker from your car at a particular hiding spot, you can still see the journey there, making it easier to police to find and recover your motor vehicle. 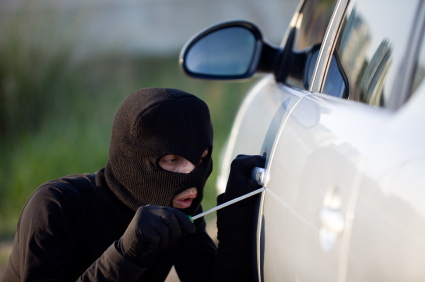 Car trackers greatly improve the chances of recovering a stolen vehicle. Insurance companies know this and will reward vehicle owners by reducing auto insurance premium rates if a vehicle tracker is fitted. In most cases the reduced insurance cost is offset by the GPS tracking costs making GPS trackers an almost “zero net cost” investment. Ask your vehicle insurer what discount they may offer with a GPS tracker fitted.